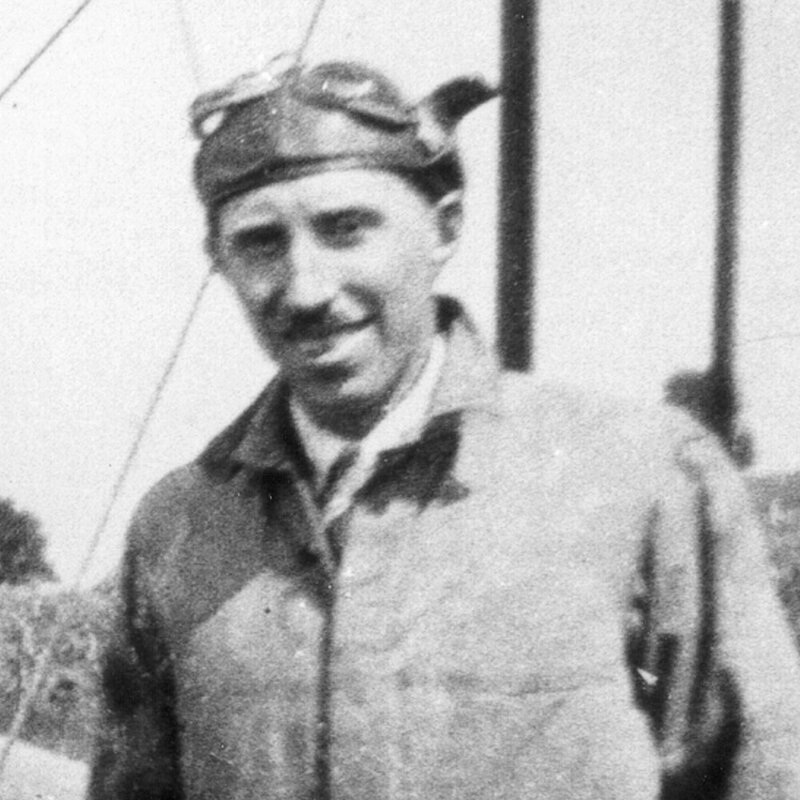 Cecil Hess’s interest in ﬂying began in 1912 at the age of 11, after seeing a French plane at the Richland County Fair. Ten years later he pursued his interest by studying mechanics at the Sweeney Auto and Aviation School in Kansas City, Missouri. Later, with the assistance of George Schlieckau, who had several vintage planes, he learned to ﬂy. Cecil then purchased his own plane in 1928 at a cost of $2,500. Accompanied by a Mr. Griffin, an army pilot, they ﬂew it from Wausau to Reedsburg. The 80 acre Siemandel farm on South Dewey was rented where Cecil built a hanger and soon after the land was purchased by the city for what is now the Reedsburg Airport. The Waco GXE10 had a cruising speed of 97 miles per hour and could be ﬁtted with runners or pontoons for landing on ice or water. Cecil gave rides to any adventurous person willing to pay a penny a pound (up to $2.50) to $10, depending upon the crowd. Cecil Hess was one of the early barnstorming stunt ﬂyers, performing at many southwestem Wisconsin fairs. They were described as “seat of the pants” flyers. Cecil said that he never ﬂew with a parachute and didn‘t need a compass. “The whip stall was the biggest thrill I got out of flying," he was quoted as saying, “You almost make the plane stand on its tail and drop down. Then you turn on the power and up she goes." Hess lived in Reedsburg since 1920 and operated a machine shop where he repaired anything mechanical, automotive and aeronautical. He needed this skill because there were mishaps with the plane from time to time. During an air show at Reedsburg in 1930, Cecil took up an aviatrix, named Mae Rox, aka, Peaches LaMar, who parachuted off the wing of his plane. The story of her tragic descent will appear in a future newsletter. Due to these and other incidents of misfortune that Hess had with the plane, Roland Cushman, local sign painter/artist, in a playful twist on words, lettered the name Miss Fortune on Cecil’s plane. Ray Palmer, a good friend, helped Hess maintain the plane. In a recent interview, Palmer recalled those days. “One day Cecil called me up and told me to stop out.” The plane had been in storage for several years by then. “Ray, I want you to help me again. In a couple of weeks I’m going to ownMiss Fortune 50 years and I’m going to ﬂy it," said Hess. The valves were stuck, the carburetor was corroded, and the radiator leaked, said Palmer, but after working on it for two weeks, they got the engine running again. After circling Reedsburg he returned and landed safely. The engine wasn’t pulling just right so they worked on it some more. On the next test ﬂight, Palmer recounted what happened. “We got her ﬁred up and she was runnin’ nice. He gave her the fuel and she started to roll and everything was going ﬁne. Well, we were down beyond that cement block hanger and all at once she turned to the left. And right up that hill we went, through the brush. Oh, the brush ﬂew! She was startin’ to lift off. We were doin’ pretty good, but thank God there was a big locust tree there. That got us — we stopped! “We went through the top of the tree and came down on the wheels on the other side. Of course, the prop was a little bit shorter than when it was made." Hess last ﬂew Miss Fortune in I978 at the age of 77. Antique plane hobbyists wanted the plane but Cecil wouldn‘t sell until after the 1978 Old Settler’s picnic. He had vowed to fly Miss Fortune one last time in honor of the meeting. He didn‘t get it running for the meeting in February, but he ﬁnally did fly her the following July. The Waco GXE10 has been carefully restored and resides at the Public Field in Shelbyville, IL. Cecil Hess passed away in 1979.